One of the things that's most impressed me about our business over the last 3 seasons is our awesome ratio of fan mail to hate mail. Seriously, when do people ever take the time to write to someone they don't know other than when they're feeling angry, disappointed or stiffed? Several times a week, though, people write to say they love our pops, and seriously, guys.....that really is what keeps us keepin' on. 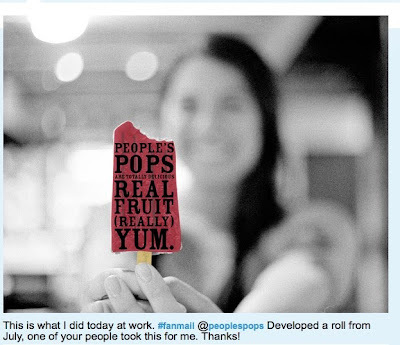 We'll say it here: OUR POPSIFANS ARE THE BEST, EVER! So in the interest of celebrating y'all, see below for some of the best mail of the past 3 summers. Hi! Just wanted to drop a note to let you know that you're doing AWESOME things and my boyfriend and I look forward to your popsicles every Sunday. Even when you aren't there! 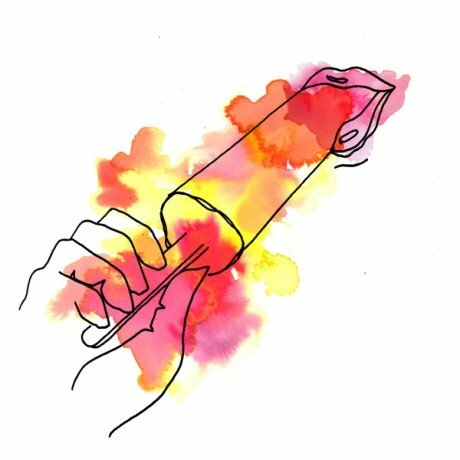 Caroline Rogers of the beautiful Looks Good To Me made our day by sending us this gorgeous watercolor she drew from the inspiration of our pops at the DUMBO Flea. The shape is wrong, but I really love the way it looks. I am writing to say thank you. I have an ulcer and I'm stuck on the acid reflux diet. Among other things, I can't eat dairy, citrus, chocolate, or spices. This summer has been hard - I'm so jealous when I see people walk around the city with their ice cream cones and cups of fro yo. I've also discovered that most ice pops in the store are made with lemon or lime juice. The only icy treat I've found to eat this summer is vanilla tofutti, which leaves much to be desired. 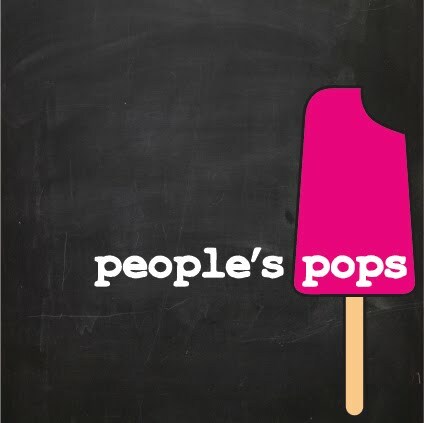 Long story short, the strawberry rhubarb people's pop I had today SAVED MY SUMMER! 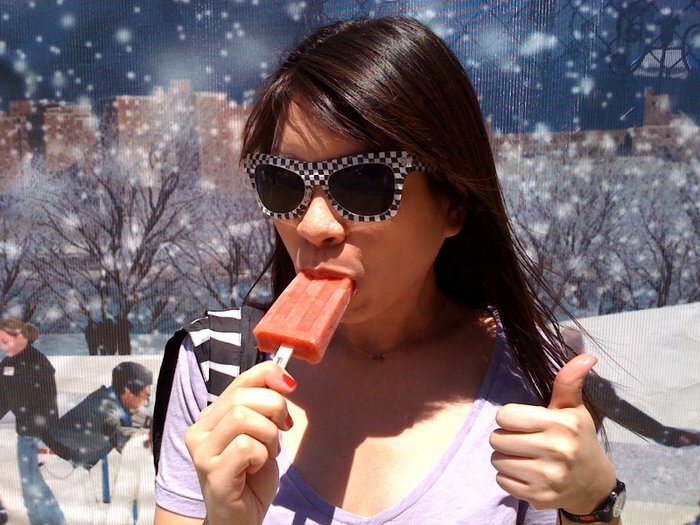 This rad-looking chick sent us a picture of herself in front of a snowscape. We liked it so much that we put it on the "Who We Are" page of our website. I checked out the pear pop a few days ago and I loved it! Tomorrow I will move on to Williamsburg and spend some time in NYC in the evenings....I will go out with a formerly Miss Sweden and stone sculptor tomorrow evening, she fell in love with me and wants to take me out for dinner and then to the prescreening from a movie about Basquiat...how exciting! Friday my plane is going back- I am fullfilled with a lot of NY stories that are engraved in my heart. Take a close eye onto yourself, keep your buisness running with ambition and passion! I live in Dallas and am currently pregnant with our second child and in the middle of awful morning sickness. I am surviving on popsicles, and thinking every day about how wonderful your pops are. So, here's to hoping that you are someday soon in a Whole Foods or other venue within driving distance of Dallas. Until then, you will be a planned stop on all my future trips to NYC. There is nothing like your pops in the stores here..... Keep it up! I had a blueberry and cream pop at the Chelsea Market back in June. I wish I could have another, but unfortunately, I live many miles from there. Perhaps I will visit again this summer and have another even though I know it will be a differetn flavor. Running a small business is BRUTAL. Every day, we have multiple moments when we wonder why we put up with the aggravation. When you write to tell us you love the pops, though, we remember why we do it, and....this makes everything worthwhile. 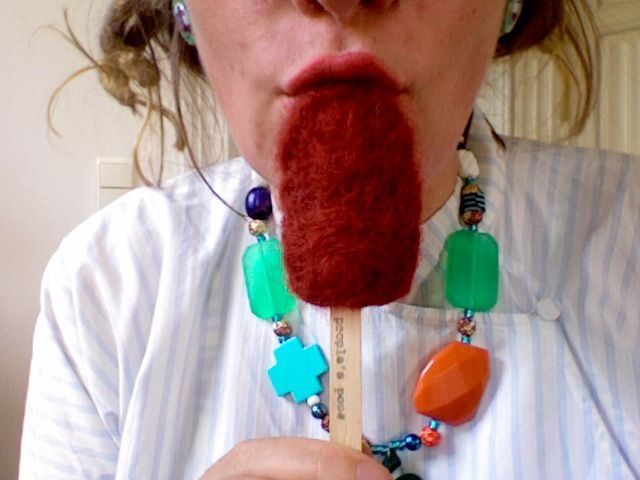 I love your "ice lolly"!!! I will return in nyc asap. Congratulations you're fantastic!!!! .. I just visited the blog to see where I could send fan mail. I'm tweeting now, it then throwing it in the mail. ilu pplspops.